Today’s blog is a fun post! 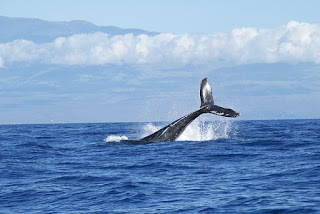 My family and I love anything Disney, so when I realized that my blogging day was also the same day as Disney, Pixar, and the Disney Parks, #SpeakLikeaWhaleDay, well, I couldn’t resist! June 11th is #Speak Like a Whale Day because Disney is celebrating the release of their newest film, Finding Dory. As a writer, I’ve admired the well-thought out and hilarious characters in every Disney film. Genie, voiced by Robin Williams in Aladdin, is hilarious and loyal. And, the Siamese cats who frame Cocker Spaniels in Lady in the Tramp, especially when they sing, “We Are Siamese,” create a classic and witty scene. 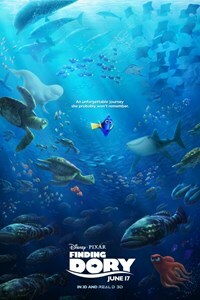 And who hasn’t fallen in love with Dory, the “blue tang with the sunny personality” in the wonderful film, Finding Nemo? One of the more memorable scenes in that film is when Dory “discovers” her ability to talk like a whale. To quote American film director, Andrew Stanton: "So, in Finding Dory, we’ll meet a new character, Destiny, the whale shark, and we’ll also learn that Dory learned to speak whale from Destiny." Can you share a silly or fun scene from your favorite Disney film? Or, because its a bonus day, can you share your favorite recipe for corn on the cob? Either way, leave a comment and one lucky winner will receive a free ebook copy of one of my sweet romances. The winner can select their choice of either I Love You More, A SnowyWhite Christmas, or Seeking Catherine. Winner will be announced June 12th. 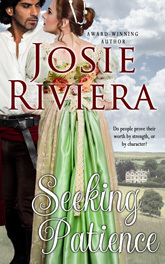 Author Josie Riviera writes Historical, Inspirational, and Sweet Romances. She lives in the Charlotte, NC, area with her wonderfully supportive husband of 40 years. They share their empty nest with an adorable Shih Tzu who constantly needs grooming and an old house forever needing renovations. My fun scene is from Lady and the Tramp in which they were eating spaghetti together. Also I might add that it is my birthday today and I would love a new book to read. My two furbabies vote yes too ;) Love the Corn on the Cob picture! Kenra, Yes, I love that scene from Lady and the Tramp. And, a sincere Happy Birthday today! Will keep you posted. :) Glad you like the Corn on the Cob photo. Thank you for the Birthday wishes! And I am excited about winning. Thank you! My daughter and I love Disney movies and it just so happen we had either just been to Disney or was going when Tarzan came out and we when to see it. In the beginning of the movie, you can hear what Tarzan is saying to the animals, but of course when he met Jane he can't understand her and she can't understand him. That this point, my daughter who mind you was not a child as she just had her 30th birthday turns to me and says why can't we understand what his saying? We could when he was talking to the animals! After trying not to laugh and not I suceeding, I lead over and explained to her. Oh! Was her respond. Then we were both laughting! Good memorie. Lots of good memories of Disney world. Millie, Yes, Tarzan is another great Disney movie! I love the music from that movie, also. Such a fun post, Josie! We add a spoon of sugar to a pot of boiling water,drop in the corn and enjoy the delicious goodness when the corn is cooked (about 8 minutes). Cute pic of you and your sister! LOL, thanks, Shanna! And thanks for the recipe, also. I can't think of a specific scene, but I love all the Disney animated movies. 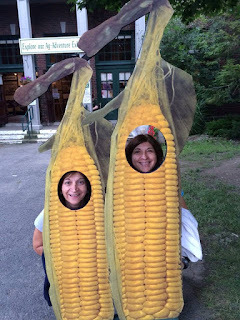 You look great as a cob of corn. Thanks for the fun post! LOL! Thanks, Merrilee! I knew there was a reason why we'd taken that picture last year! I've always enjoyed the scene from The Jungle Book where they sing I Wanna Be Like You (The Monkey Song). Michele, I love The Monkey Song, too! Congrats, Kenra! Thanks so much for your comment! You've won a free copy of one of my sweet romance novellas. Please email me for details...and belated Happy Birthday! Thanks for the topic. I have a rest thanks to paper now org. Only so I have time to learn and relax. I have time for friends, family and leisure.